Jonathan Pinkerton, a claims investigator for Lloyds of London is sent to a small western town in Arizona to find a million dollars stolen by three crooks from a bank. Upon snatching the loot, one of the criminals had killed his two accomplices. In this town, Pinkerton encounters a number of possible suspects involved in the crime. While he carefully tries to deduce the identity of the mastermind, a number of attempts are made on his life in the interim. 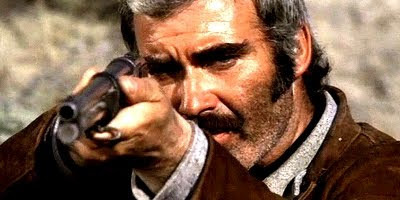 Mario Bianchi, director of the brutal, but bush-league Fasthand Is Still My Name from the same year, was also an assistant director for the even more abysmal Shango, 1970, and the average war epic, Churchill'S Leopards also in 1970. Those adjectives are apt descriptions of Bianchi's guidance here in what amounts to a seriously handicapped 'Sherlock Holmes In the Old West'; If only Woods had been carrying a pipe and magnifying glass. Another murder mystery western, it's mediocre at best. Both the fights and music are poor, the acting static and the towering Robert Woods is strangely out of place as a sharpshooting Englishman. Saddled with a wig, Woods looks amazingly like Tomas Milian here. The dubber also completely fouls up the British accent, which is absent for nearly the entire film. The bewildering Trinity style antics with accompanying circus music are likewise woefully out of place. Ivano Staccioli, Spartacus and the Ten Gladiators, 1964 and Nieves Navarro, A Pistol For Ringo, 1965 also feature in this picture. Bianchi also wrote the story and contributed to the screenplay which includes an eccentric doctor whose snakes occasionally get out and kill. One of the robbers from the beginning also sports a pistol with a crude silencer which is seen only once. Slapdash from start to finish, it's yet another minor league western whose obscurity isn't too hard to fathom. Only completists need apply. There's no winning hand in this game.